To ensure 90 degree corners and plumb walls, a contractor runs string lines between batter boards when laying out foundations, pools, or landscaping. Rousseau claims their reusable batter boards reduce labor costs by making setup faster and easier. You could also see long-term savings by using their batter boards instead of expensive wooden ones. You can adjust the reusable batter boards in two planes — they slide up and down over the forming stakes, and laterally with a steel slide. Rousseau constructs the batter boards out of heavy-duty steel with a powder coating, for durability through job after job. 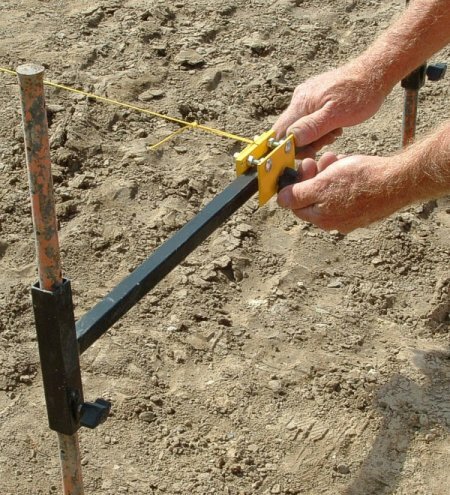 To use the batter boards, drive 3/4″ forming stakes through the frame. Set the elevation, and lock the batter boards to the stakes. Then set the string lines with the slide, and lock the slide into position. A four-pack of batter boards runs a little more than $60. To save a little money you could buy the eight-pack for about $105. The steel batter boards, adjustable locking sliders, and string line are included in each pack.